One of my favourite things to make with leftover egg whites are meringues. 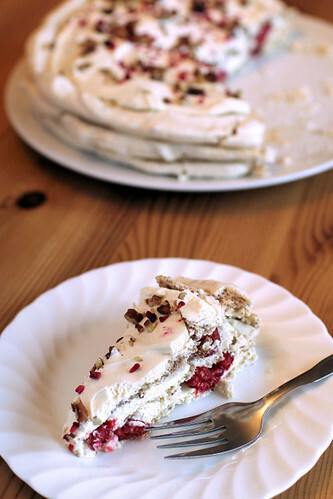 I made up this easy 3 layer raspberry meringue torte for the husband's birthday. 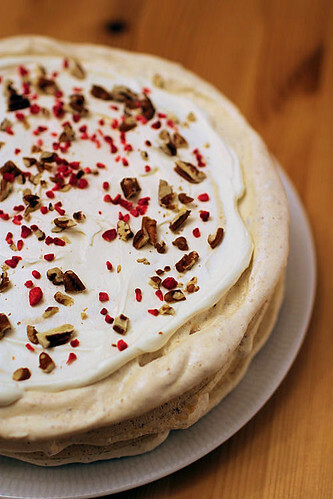 If you like your meringue crunchy, eat on the day you make it because it will go soft due to the double cream filling. Line three baking trays with baking parchment and use a 23cm round plate, or tin, as a template to draw a circle on each piece of parchment. Turn the paper over so the circle marks are on the underneath. Put the egg whites into a clean, large, grease-free bowl and whisk until they form soft peaks. Add the sugar, a tablespoon at a time, whisking until the meringue is stiff and glossy. Gently fold in the chopped, roasted pecans, reserving a tablespoon for serving. Spread the meringue equally onto the three baking sheets, keeping just inside the circle. 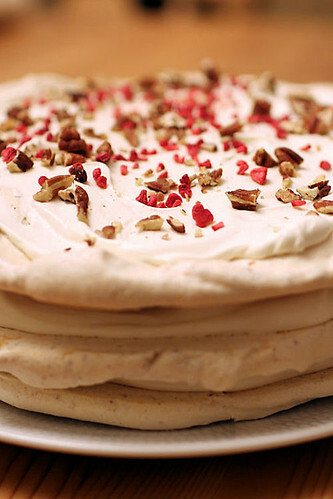 Bake in a pre-heated oven at 150ºC/300ºF/Gas Mark 2, for about 1½ hours, until the meringues are pale and crisp. Remove from the oven and place the meringues onto wire racks to cool. Whip the cream to soft peaks and fold in the raspberry liqueur. To assemble the dessert, place one of the meringues onto a serving plate and spread a third of the whipped double cream over. Scatter half of the raspberries over the cream and place another meringue on top. Add another third of cream and the rest of the raspberries, followed by the last meringue disc. Top with the remaining cream and scatter the reserved pecans and freeze-dried raspberries over the top. this is gorgeous, nic! i can't think of a more elegant and classy dessert.